Those of you who have been following this Blog for some time will know how much I obsess over "the film look", and my rather reluctant conclusion that "if you really want it, you have to shoot film". I've been somewhat disappointed by Film Emulation Software from DxO Labs, and the GIMP Plug-in G'mic, although I was amazed at how similar the results are when comparing these two. I won't say that G'mic copied DxO, because they've both got the same goal in mind, but I will say that G'mic has so-successfully reverse engineered the DxO product (without actually knowing this is actually the approach they took), that if you are a GIMP user, you needn't bother purchasing DxO Film-Pack 4. I find myself asking these same question over and over - "what is the film look? What influences it" Can it truly be well emulated digitally? As an owner of many film cameras, do I really want to emulate it?" The answers are below. 1) What is the "film look?" This is so difficult to answer, because often, film can be a lot more pristine, and high-res in comparison, depending upon the camera used, the quality of the film stock, and the care taken in processing it. But most often, it is not - when using consumer grade film like Ultra-Max 400, developed at Walmart, and scanned at home with a consumer grade scanner, film does come off quite "botched" in many ways. When compared with a pristine digital photograph, film is not-so-pristine. I've found that out time after time. But film is, for many reasons, easier on the eyes, more exciting to look at, and most importantly, seems to make much more exciting digital CMYK prints. 2) What influences the "film look"? I listed some things above - the camera used, etc. I will add to that list two things - the lens used, and, of utmost importance, "white balance". Herein lies the secret, I think, and I'll explain this further below. 3) Can the film look be well-emulated digitally? Yes, with some work. First of all, Film Emulation Software can only do a generic shift with your JPEGs to create the most obvious qualities of any given film. I find that they never "improve upon the perfection" of a JPEG, but rather, apply specific Degradations to create emphasis of a given film's best known qualities. If this is true, then what, if any further work can be done with a Camera RAW file for more successful film emulation? 4) Why do I want Film Emulation when I can still get film, and own some great (and not so great) film cameras? I am getting less and less certain of film's future. It will certainly never go away completely, but film processing will most likely disappear from all places which I personally can easily drive to, do some shopping, and pick my developed negative up in less than an hour. Another factor is what I said in my previous post - film contains some real problems of it's own, being chemical in nature, far more-so than you'd get with a digital camera. Also, many of my cameras are broken in some way - bad light seals, film counters that don't work, things like that. They'e getting as old as I am in most cases, and I find myself breaking down too! So why do I want Film Emulation? The bottom line is that I love film photographs, but doing film photography sometimes gives me trouble that can be avoided with digital. 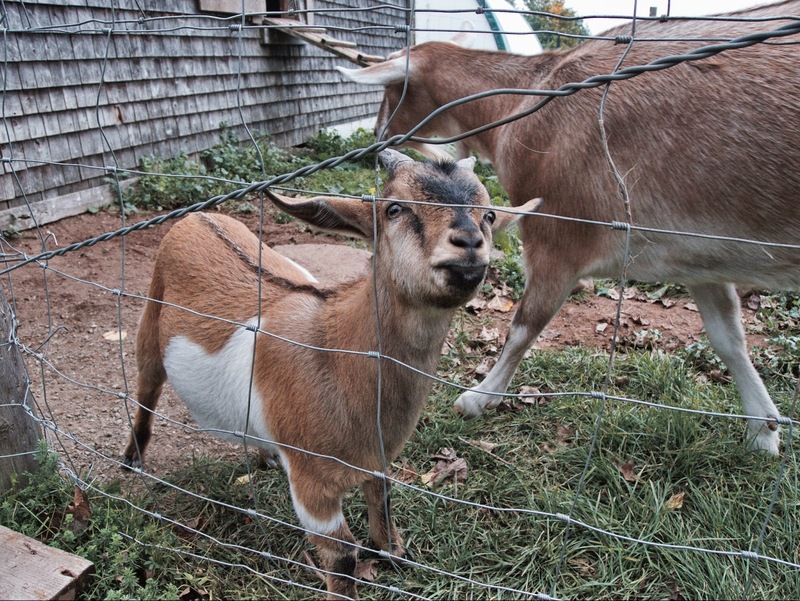 Consider the two sample photos of little "Sprocket" the Pygmy Goat. Starting with a bit of a disadvantage of using my digital pocket camera instead of my DSLR, I will point out that the straight from camera JPEG is good, but not great. Actually, I can say exactly the same thing about the JPEGs from my DSLR too - it would've been almost identical to what you see in the second picture above. This, I remind you, is why I always shoot with RAW + JPEG enabled. Lately, I've been secretly re-processing a few RAW files taken with this same camera, with a specific goal in mind - try to create a "Film Emulation" photo I can be real happy with, and make the approach re-producible. I began this with the premise that one of the biggest issues with film is "white balance". With a digital camera, you can simply set it to "Auto White Balance" and forget it - 90% of the time, the camera will get it perfect - this is a big part of the pristine-ness of a digital photo. Beneath that setting of "Auto-WB", there are many values the camera can choose from, such as sun-light, cloudy, shade, flash, incandescent and fluorescent. There is also a continuous range of "Degrees Kelvin" values that the camera will choose to provide perfect WB, if none of these WB colours is correct. But White Balance with film is entirely different - historically, there were two available - "Daylight" and "Tungsten", and I'm not sure that Tungsten is available any more, leaving Daylight film to cover the entire range. To make this work back in the film era (those golden decades), one had to fix Filters which had some compensation tints to the front of their lenses - they were just a few - "Daylight", Incandescent" and "Fluorescent", which would provide a degree of compensation to be used at the discretion of the photographer. I've never used these, mainly because I have so many film cameras, with many different sized front lens threads - in my film shooting, I just take what I get. And it's what you get with film shooting in all of the above lighting conditions with only one single WB type available, which is what makes Film Emulation Software miss the mark - the software writers cannot possibly know what lighting conditions were actually used in any given shot, and so a "Vanilla" WB value is always used. Today, this means that "Daylight" balance for film is fixed and un-movable at around 5100 K.
When I took the picture of lil' Sprocket, it was in an overcast sky, but the surrounding colours were combinations of green, and warm browns, so the camera selected a "perfect" temp of 5820 Degrees Kelvin (K). But, to make my picture "look like film would do", I had to use software (in this case, Photivo) to cool the colours - so I manually moved the White Balance slider to a much cooler setting of 4960, which tended to "blue" the overall tint of the photo. You can notice especially how the green grass "ain't quite as green green as it used to be", and the grey barn shingles, and the fencing wire, are quite a bit bluer, but I find this more pleasing than the "perfect" WB the camera gave me. I then made some further minor brightening and micro-contrast adjustments to the RAW file, then exported it as a JPEG, which I opened with GIMP, and used the G'mic Film Emulation filters to select from it's wide range of film types. A fave of mine is Fuji Astia 100 (a colour reversal (slide film)) - I love the way it turns green things into a yellow-green; that is to say, if there's any yellow within a green, Fuji Astia 100F will emphasize it. This is just slightly noticeable in the upper photo, in the dead leaves laying on the ground. I love this result! To me, it looks like it could've been taken with my Yashica Lynx-14 Rangefinder. It is full of air and life, much better than the flat looking Camera JPEG. Keep in mind, these are exactly the same shot taken with the same small-sensor digital camera... and from some previous experimentation I've done, I would say that I've gotten a simple, reproducible method of making great film-looking pictures from a RAW file, using all Open Source (freee!) software. Don't know if you're aware, but these same emulations are now also available in RawTherapee as well. Previously a good workflow would have been to correctly develop the image in the raw processing phase (including WB of course), and to push the film emulation further down the pipeline after those edits had been made (including any number of other adjustments that one would make during raw development).